MONROVIA, Ind. - September 13, 2011 - Sarah Aubrey has been accepted as a professional member into the National Speakers Association (NSA) as of August 2011, following the Association's extensive internal review process. Member qualifications include presenting a minimum number of speeches annually and/or generating a minimum amount of revenue from paid speaking engagements. Aubrey is now part of the NSA network which brings professional speakers together to excel in their careers and better serve clients. She is also involved in several NSA sub-groups including the Motivational/Keynote, Seminar/Workshop Leaders, and Writers/Publishers groups. The NSA, established in 1973, is the leading organization for professional speakers. For more information, visit http://www.nsaspeaker.org/. Aubrey provides speaking services focusing on entrepreneurship and small business development strategies, including assisting audiences in finding and applying for grants. Aubrey is a member of the Writer's Center of Indiana where she consults fellow members on developing successful book proposals suitable for publishers. A full time entrepreneur since 2004, she created and sold a direct marketing business, Aubrey's Natural Meats, LLC. in 2008. She is the author of two non-fiction books with over 50,000 copies sold worldwide. Starting & Running Your Own Small Business Farm (Storey Publishing, 2008) helps niche farmers position themselves well for the opportunities afforded by today's market. Aubrey's second book, The Profitable Hobby Farm, How to Build a Sustainable Local Foods Business (Wiley Publishing, Inc., 2010) is a down-to-earth guide giving all the information one needs to know to start a local foods business. Aubrey's company, Prosperity Ag and Energy Resources, is a full-service funding opportunities firm which aids entrepreneurs, communities and institutions of higher education in securing grants and loans in the areas of agriculture, energy, environment and food manufacturing. More information can be found at www.prosperityagenergy.com. Last month, Prosperity was out and about enjoying summer and many agricultural activities. 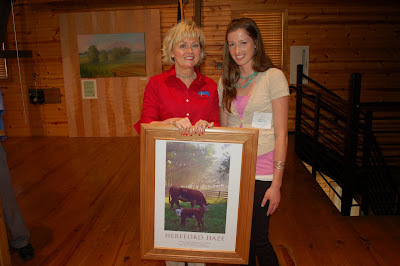 On Farmers Day, August 17, and in honor of Sarah, I attended ISDA's Celebration of Agriculture & Photo Contest Reception in the Normandy Barn at the Indiana State Fair. The highlight of this event was the presentation of the 2011 AgriVision Award presented by L.T. Governor Becky Skillman, which honors a Hoosier who has displayed a deep commitment and vision for Indiana agriculture. 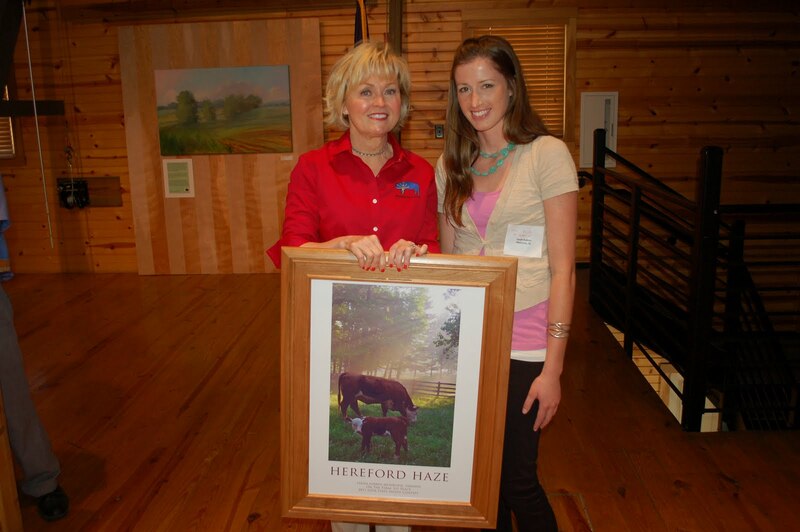 In addition to the award ceremony, I was happy to represent Sarah as she was recognized as a 2011 ISDA Photo Contest winner with her picture, "Hereford Haze." Her photo was on display in the Normandy Barn for the duration of the state fair, and is currently on display in a traveling photo gallery. All winning photos will also be in a 2012 calendar sponsored by Indiana Farm Bureau and designed by Hoosier Ag Today. Also in the month of August, I attended Indiana Farm Tours in Southern Indiana hosted by the Indiana Soybean Alliance. The tour was a two-day experience, and stops were made at multiple ag production facilities. A tour bus carried participants to facilities consisting of cattle, egg laying pullets, hog, turkey and chicken, and dairy. Thank you Indiana Soybean Alliance for hosting the tour!